Let’s talk about an aspect of Luke Cage that I imagine is going to be pretty divisive: It’s pacing. Light on action and heavy on dialogue, this show unfolds at a relaxed pace that will probably frustrate a lot of viewers. But I personally love that Luke Cage gives its scenes so much room to breathe. Unlike a traditional TV show, where you have to wait a week between episodes, I know the next Luke Cage installment is only a click away. And that makes me a lot more patient about the fact that this show is in no rush to get to the fireworks factory. Instead I can appreciate the depth it’s bringing to its world building and character development. Take, for instance, the conversation between Luke and Bobby Fish that unfolds in Pop’s smashed up barbershop at the start of this episode. On the one hand, that conversation is designed to move the plot along: Bobby informs Luke that if they ever hope to open Pop’s again, they’ll need to assemble enough money to keep paying the building’s bills. That’s why Luke decides to steal the money from Cottonmouth (while also punishing the criminal kingpin for his role in Pop’s death), which is the main thrust of this episode. But those Luke/Bobby scenes (including their delightful post-heist chat) also convey so much more than mere plot concerns. They develop the relationship between two acquaintances who become fast friends and partners due to their mutual love of Pop. They also shade in Bobby’s character as more than just the kooky guy who plays chess. He explains to Luke that he first met Pop when they would play chess in Marcus Garvey Park together. But he also refuses to pretend Pop used to beat him (“Just cause the brother’s dead don’t mean I got start changing the facts”). That exchange not only makes the show’s version of Harlem feel more lived-in, it informs us that Bobby is loyal, kind, funny, and—above all—honest. A show obsessed with moving the plot along wouldn’t have time for that kind of character-driven moment, but Luke Cage knows that world building is as important as action. And that’s true of a whole bunch of different scenes in this episode, like the conversation between Misty and her partner Rafael Scarfe about the Celtics. It’s not strictly necessary on a plot or thematic level, but it establishes their rapport and adds realism to their friendship. So although it’s not exactly surprising that Scarfe turns out to be a dirty cop by the end of this episode (R.I.P. Chico), we still palpably feel the betrayal on Misty’s behalf. We’re invested in them as a pair far more than we were before we got a glimpse of their friendship. It’s a relatively straightforward dynamic, but the episode also makes time to complicate our understanding of both characters as well. For all his obsession with money, Cottonmouth has a more magnanimous side too. He pays for Pop’s funeral and even tries to make nice with Luke to appease Pop’s memory. And we learn that Mariah’s “New Harlem Renaissance” campaign isn’t just for show. As she explains to Cottonmouth in the park, she really does care about revitalizing the community. Of course, she also knows it’s a good way to shore up support, but her dreams for Harlem aren’t just “spin,” no matter how much Cottonmouth might dismiss her. Of course, it also helps that for all its dialogue-heavy scenes, “Who’s Gonna Take The Weight?” also has the most impressive Luke Cage action setpiece to date. And boy oh boy is it fun to watch. 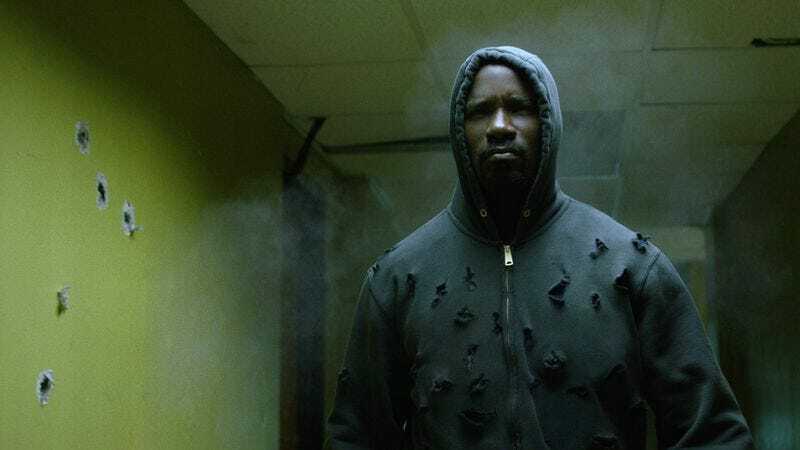 While Matt Murdock relies on spry martial arts skills and Jessica Jones on brute strength, Luke’s powers are as much about defense as they are offense. He’s basically a tank with little concern for the bad guys shooting at him. He’ll bat them out of the way if they get annoying, but he doesn’t need to kill anyone or even dodge their bullets to complete his mission. And that means Luke’s Crispus Attucks break-in is visually distinctive from any heist I’ve seen before, not least of all because it’s scored by the Wu-Tang Clan’s “Bring Da Ruckus.” That such an inventive action sequence comes in an episode that’s equally concerned with character and world building is just icing on the cake. Standout moment: I thought the exchange between Luke and Connie at the end of the episode was incredibly sweet and Jade Wu turns in a lovely understated performance (“The food wasn’t that good”). Also literally the last thing I expected was for this episode to end with a rocket launcher explosion. Marvel Cinematic Universe connections: I don’t think I caught any. What did I miss? Burning question: What do you guys think of the musical acts at Cottonmouth’s club? I like them but they also remind me of the way every show in the early 2000s had to feature a musical venue and performances from real-life bands.